Harrie Walter Wade, farmer, accountant and Country Party leader in the Senate, was born on 10 January 1905, at Clear Lake in the Wimmera district of Victoria. He was the son of Victorian-born parents, Harrie Walter Wade, farmer, and Ada Louise, née Edmonds. He attended the local primary and high schools at Horsham, then worked for a time as a schoolteacher and a clerk, before moving to Goroke, a small town west of Horsham, where he became an accountant. On 15 October 1932 Wade married Olive May Newton, a bookkeeper from Horsham, in St John’s Church of England, Horsham. In the mid-1930s, Harrie and Olive took up farming on the banks of Natimuk Lake. Becoming increasingly involved in local politics and community affairs, Wade joined the United Country Party in 1934, and in August 1941 was elected as a councillor for the Shire of Arapiles, becoming president in 1948 and again in 1951. Unsuccessful in his proposal for an irrigation settlement around Lake Natimuk, which he considered could be used for the settlement of ex-servicemen, he initiated the formation of a local firefighting unit, and was appointed president of the Natimuk Bush Fire Brigade in October 1941. At the beginning of 1944, a disastrous fire swept through parts of the Wimmera, and Wade played a central role in organising the firefighting and the subsequent clean-up. In 1948 he became president of the No. 17 Region Rural Fire Brigades’ Council and in 1950 vice-president of the Victorian Rural Fire Brigades’ Association, serving as state president from 1954 to 1958. Wade was also a member of the Country Fire Authority. In 1949 he stood, unsuccessfully, for election as the endorsed Country Party candidate for the federal seat of Wimmera, on the platform of ‘IT IS NOW OR NEVER’, asking his constituents whether they wished ‘to maintain a free way of life or entangle themselves in the fetters of socialism’. In 1951 he served as vice-president of the central council of the Country Party and was elected its chief president in 1952 and in 1953. At the end of his presidential term, Wade observed that the party had never been in a stronger position, though he warned his colleagues not to ride ‘the horse of confidence without a sure rein’. He also served as a member of the CP Federal Council from 1952 to 1957 and in 1962, including a term on the Federal Executive. In 1954 Wade sold his property at Natimuk Lake and moved to Horsham, where he became vice-president of the Wimmera Trotting Club, a member of the Horsham State School Committee, president of the Wimmera Band Group, president of the Central Wimmera Football League (from 1955 to his death) and vice-president of the Natimuk Agricultural and Pastoral Society. In 1955 he topped the poll for the position of councillor on the Horsham Municipal Council, a position he held until 1961 when he stepped down. 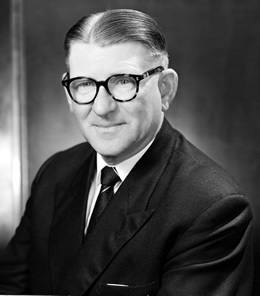 Wade stood, successfully, for the Senate at the federal election of 10 December 1955, arguing that a Labor majority in the Senate would give the ALP an opportunity ‘to obstruct and sabotage the good work of the Menzies–Fadden Government’, and force it into double dissolution, as had happened in 1951. Delighted with his election, the Countryman pronounced that the choice of Mr Wade was a popular one, and that his firsthand practical experience on the land made him a valuable asset to the federal Government. The underlying plank of Wade’s political philosophy was his belief that Australia’s prosperity, including a flourishing secondary industry, was anchored in a healthy and vibrant primary industry. He stated that ‘the whole basis of our prosperity is the state in which our primary industries happen to be’, arguing that this must be the case, ‘because the wealth earned by primary industries is ploughed back into secondary industries’. In the Senate, he spoke of encouraging young men to settle on good tracts of land enjoying adequate rainfall, which were, he said, ‘crying out for development’. Particularly interested in wool and its promotion, he was concerned that the industry was engaged in ‘a death struggle with man-made fibres’, and suggested that, with a falling market in wool, a duty be imposed on imports of synthetics. In 1960 he noted that the recently established Commonwealth Development Bank provided long-term loans at cheap rates of interest, and concluded that ‘the provision of credit facilities and more vigorous research’ would assist wool, as it had wine. He was ever conscious of overseas markets, the meat industry also attracting his serious attention. On many occasions, he urged Parliament to keep the costs of production down, and called on the Government to consider setting up a section within the Tariff Board devoted solely to watching the interests of primary industries, not, he said, that he wished to support inefficient producers. As a nation Australia had to face the fact that markets were competitive. Wade was acutely aware of Australia’s position in the Asia–Pacific region. He described Australia as ‘a western outpost of democracy in an Asian area’, once stating: ‘If we are to justify our existence as a nation, we have to take cognizance of those peoples in the areas to our near north who are searching for a better way of life’. He wholeheartedly supported the Colombo Plan, and the Japanese Trade Agreement of 1957. In January 1958 he joined a parliamentary delegation to Japan, where he lobbied on behalf of Australian wool. His earnest advocacy of the policies of the Liberal–Country Party Coalition Government, as well as his obviously sound administrative abilities, led to his becoming Minister for Air in the Menzies Government on 29 December 1960. He served until December 1961, when he became Minister for Health. In March 1961 he became leader of the Country Party in the Senate. As Minister for Health, Wade initiated a number of amendments to the National Health Act to increase or extend hospital benefits. He believed that ‘a voluntary insurance scheme based on self-help is the most appropriate to our Australian needs’. Wade died in office on 18 November 1964 after being taken ill on his Horsham property while mustering sheep. His wife survived him, as did his son. Wade was accorded a state funeral, and the service was conducted at St John’s Church, where he and Olive had married. At some stages the funeral procession stretched for more than 3 kilometres. Hundreds of people, including parliamentarians, service chiefs, councillors, officials of the Country Fire Authority and the Victorian Rural Fire Brigades’ Association, as well as friends and local schoolchildren, lined the streets to pay tribute to a man much admired in his community. A close colleague remembered Harrie Wade as a man for whom the honourable course was the only one to take in public and private life. He was a man who was never ‘found in a dark corner’, one who ‘detested intrigue and slyness in every shape and form’, and who ‘ploughed a straight furrow, and reaped a rich harvest of goodwill from his fellow men’. Kathleen Dermody, ‘Wade, Harrie Walter’, ADB, vol. 16; West Wimmera Mail and Arapiles and Kowree Shires Advertiser, 14 Aug. 1941, p. 1; Australian Municipal Journal (Melb. ), Dec. 1964, p. 254; Allan Lockwood, Nine Around the Table: 100 Years in the Shire of Arapiles, Council of the Shire of Arapiles, Natimuk, Vic., 1988, pp. 120, 122–3, 135, 141, 143; West Wimmera Mail and Arapiles and Kowree Shires Advertiser, 6 Nov. 1941, p. 1; Victorian Rural Fire Brigades’ Association, Annual report, June 1965; Horsham Times, 2 Apr. 1948, p. 1; CPD, 17 Oct. 1957, p. 675. Stawell News, 30 Nov. 1949, p. 2; Country Party (Victoria), Notice to members, 37th and 38th annual conferences, 1953–54; Countryman (Melb. ), 17 Apr. 1953, pp. 1–2, 2 Apr. 1954, p. 1; Sir John McEwen Papers, MS 4654, box 71, NLA; Lockwood, Nine Around the Table, p. 149; Warracknabeal Herald, 11 Nov. 1955, p. 16; Countryman (Melb. ), 11 Nov. 1955, p. 1, 25 Nov. 1955, p. 1, 13 Jan. 1956, p. 1, 6 July 1956, p. 1. CPD, 2 Oct. 1957, p. 307, 17 Oct. 1957, p. 673, 9 Apr. 1959, p. 671, 26 Aug. 1959, p. 294, 26 Feb. 1959, pp. 222–3, 28 Sept. 1960, pp. 749–50, 10 May 1961, p. 873, 14 Apr. 1964, p. 610, 24 Aug. 1960, p. 173, 23 Aug. 1960, p. 162. CPD, 21 Oct. 1959, p. 1100, 26 Feb. 1959, p. 221, 16 Sept. 1958, p. 358, 2 Oct. 1957, p. 306, 26 Mar. 1958, p. 376; Current Notes on International Affairs, Jan. 1958. CPD, 14 May 1964, p. 1148. SMH, 21 Nov. 1964, p. 4; Countryman (Melb. ), 3 Dec. 1964, p. 5. This biography was first published in The Biographical Dictionary of the Australian Senate, vol. 3, 1962-1983, University of New South Wales Press Ltd, Sydney, 2010, pp. 51-54.